Two-stroke snowmobiles are meant to be ridden hard. Repeatedly pushing a machine to wide-open throttle during all-day, aggressive riding, however, takes its toll on the engine. INTERCEPTOR Synthetic 2-Stroke Oil is specifically designed for maximum performance in all makes of two-stroke snowmobiles, including Ski-Doo®, Polaris® and Arctic Cat®, helping enthusiasts spend more time riding and less performing maintenance. It is compatible with nearly all other two-stroke oils, while its low-smoke, low-odor properties help ensure riders won’t be “smoked out.” INTERCEPTOR is engineered to be pushed as hard as the sleds it protects. Snowmobile engines have evolved to run on leaner gas-to-oil mixtures, increasing harmful friction and heat. INTERCEPTOR’s synthetic formulation incorporates highmolecular-weight components with high flash points that resist burn-off. 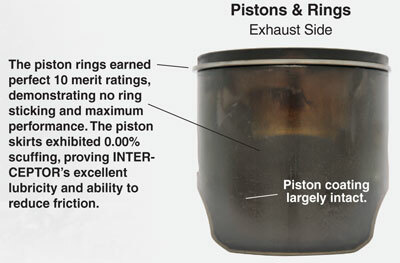 As a result, a greater amount of oil survives the combustion process to provide lubrication and protection. Its excellent lubricity and film strength inhibit metal-to-metal contact. 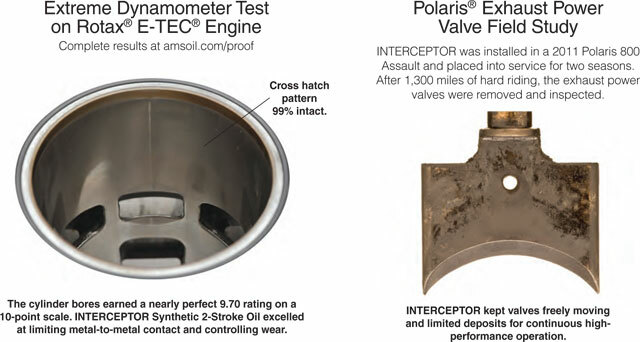 In extreme dynamometer testing, INTERCEPTOR’s anti-scuff/anti-wear formula completely prevented piston skirt scuffing.